I love Acorns – and Pine Cones – and Broken Branches – and Conkers – and Sycamore Seeds (or as Daughters 1 and 2 used to call them: Helicopters), – and Conkers (seeds of the horse chestnut tree) – and … well anything which trees give to us. They’re all such wonderful gifts from Nature and given to us freely. So making an Acorn project is an absolute joy! These particular Acorns aren’t ‘fallen from a tree’ Acorns. These are cut and turned pieces of hard wood, shaped into beautiful little Acorns, sanded smooth and ready for me to do something wonderful with. So I did. I gave each Acorn a voice of its own and brought forth the positivity which I could feel just from holding the Acorn in my hand. It was the oddest thing, but with each acorn I could feel a real feeling of uplifting comfort; encouragement; calmness; peaceful and peace filled, and .. oh … what felt like a hundred different feelings of wonderfulness. I began to notice that upon holding each acorn in the palm of my hand, I would get a different word pop into my mind. So I began to write the words down on my note pad. 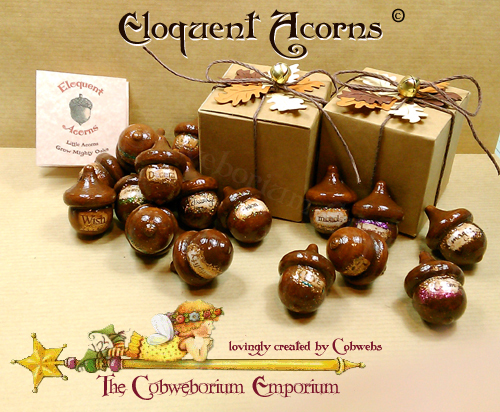 And, as you can see from the photo’s – now, each acorn travels with its own word emblazoned on its little nut! Each of the Acorns is meant as symbol of encouragement and positivity. Acorns really are little miracles. I know that people now are too cynical and don’t believe in miracles, or there are some who are of the belief that miracles are the work of a dark force. Whereas I … aw, I see miracles happen every single day. This summer, I’ve watched the baby squirrels born in the tree tops, in the garden of Cobweb Cottage, leave their nest, with mommy in attendance, and learn to carefully scramble down and back up the tree again. I watched them day after day, slowly learn to race up and down the huge, tall pine trees, and laugh and cackle and ‘bark’ at each other as they’ve learnt to jump the wide spaces from one tree to another. All the time they were keeping an eye on Miss Maisie the Cat who cannot understand how these strange, chattering creatures can move so fast! And there I am, stood in the garden, giving thanks for being in the right place, at the right time, to witness the miracle of baby squirrels growing up and learning how to do what they were doing, and smiling all the time, feeling blessed, because I was watching this miracle of nature. I’ve sat in my craft room in the garden, and watched a Magpie learn how to play and get a bit of fun by standing on the high ridge of the Cottage and drop a pebble so that it bounces over and over down the roof and then finally hits the conservatory roof and flies off onto the decking where it makes a combined noise of ‘PLOP’ and ‘CRACK’. And that Magpie LOVES his game. So much so that he pops off, finds another pebble then comes back and goes through the whole game all over again. Now … call me daft, but in my mind, him teaching himself this game is a little miracle to me, and I watch him in wonderment, all the time grinning like a fool – so much so that my face begins to ache! I’ve heard baby birds in our nest boxes, emerging from their eggs and screeching for their food, when they hear the mommy bird land on the nest box with a beak filled with wriggling insects. The miracle of life. Nature. Every day! FREE! Nature sends us Postcards all day every day, but unless you look up and see these Postcards then you’ll miss them and not see the Miracles that these Postcards hold. And likewise … Acorns are, for me at least, a Postcard. And these Acorns, are my version of those postcards. My interpretation, if you like. Each one has a completely different, uplifting, positive, word of encouragement and meaning. No two are the same. They can be popped into your bag or your pocket and taken with you wherever you go. Or, because they come with a ribbon on them, they could be hung on a Christmas Tree, or a metal hanger, or maybe one of those crocodile grip/note holders on your desk. Or simply put somewhere you want them to be, so that you see them now and again and they remind you of their message. I have to admit that these weren’t a quick make. I’ve been making these over the past few weeks, doing a bit now and again, then waiting until I can get to the next stage. I knew how I wanted them to look so had already planned out how to get there. But … they did take rather longer than I would have liked. Yeah …. that about sums up life here in Cobweb Cottage. 🙂 Wise man, that Confucius. Well, that’s me done and dusted. Now let’s get to the important bit . . .
How the dickens are you? Is life treating you kindly? Is everything fine and groovy in your world, or is something causing you a bit of trouble? Feel free to unburden yourself and if I can help in any way, or suggest something you might not have thought of then I will. If I can’t help then I’ll sit with you and just hold your hand. If someone is bothering you, then you tell me who they are and I’ll put on my boots and come and sort them out!! I might be little, but when I’m roused I am MIGHTY! (and I can control a classroom of noise makers even when their own teacher can’t – simply by saying ….. “ERMmmmm Excuse ME??!!!! !” In the right way, right tone, and right volume. And yet … they all still love me afterwards. LOL! – yes, it’s really true!). So coming and sorting someone out for you will be a walk in the park! BUT … if life is treating you kindly and you’ve won a few pounds on the lottery (or couple of dollars), then do tell because I can then laugh with you as we plan your spending trip! Maybe you’ve made a new friend? Got a new job? New baby? New House? (Rabbit 🙂 ). New car? Old car back from the garage but with a lower bill than you expected? Whatever it is, if it’s happening or on your mind, then share and/or unburden and we’ll have a coffee together and chew it over. Oh… and I have biscuits – so we can chew on those too! For now, I must thank you so very much for coming, and for spending a coffee moment with me. I’m so happy to see you here. Seriously so. You make the internet such a great place for me to be . . . and I know that for some folks, it can be a bloomin’ nightmare! So thank you. You’re amazing. Sending much love to you my fabulous blog friend, and wishing you a truly wonderful day. Previous Broom Pole Bird Houses. Next The Story of the Spoons. Ohh Tam!! What a great encounter with your rascally squirrel! You’re going to have this story ready to tell for ever and ever! I wonder how he managed to come into the store in the first place. And … what on earth was he eating which made him turn his nose up at the food you’d left out for him so that you could capture him and take him back outside again. At some point you’re going to come across something(s) which have been nibbled and tasted by Mr. Squirrel. lol. I absolutely LOVED this story and am so happy to have you share it with me. You should put it in a blog post – because I bet my sweet bippy that your readers would enjoy it too. Aw Tam thank you so much for coming and giving me my first big smile of the day – both to my heart as well as my face. I have loved this coffee moment with you, may there be coffee moments with each other for a long time to come. Thrilled you enjoyed the post and liked the Acorns! Your acorns are lovely. We have a 200-year-old oak tree looming over our house. The acorns are surprisingly small. Ahh, the acorns from your 200 year old oak tree may be small, but each one of them has their own 200 year old(and longer) in the making and waiting for the magical moment. Thank you for coming Anne, it’s always lovely to see you my lovely blogging friend. Glad you like the Acorns. Once in a while I pull up a tiny sapling, but it isn’t often. Well sometimes it’s necessary Anne. I too have had to pull up two tiny potential trees. One I did ask Mr. Cobs to take into the wood behind our old cottage, and find an open spot where the light came in and re-plant the baby Oak in training. Bless his heart, he did and he checked on it now and again and last seen, it had settled in nicely and was growing. Sending big hugs and plenty of love right back, Anne. Aw thank you! 🙂 Both for your lovely comment and for coming to share a coffee moment with me. Firstly … apologies for not having emailed. Things got ‘interesting’ around here, but I will email asap. Aw tickled you like the Acorns. I love them too. But no, I personally didn’t turn these myself. The last time I was on a lathe was when I was 15 years old and learning about woodwork at the local boys school. I went to an all girls school and we didn’t have lessons like this in our school, so there was an option to go and learn for one afternoon a week at the nearby boys school, and me being a lover of all things arty crafty, I jumped at the chance. I learned sculpting with wood. Carving. Joints. Angles …. and all sorts of things, but the lathe was the last thing I tried. I was scared silly about using it and so were all the other girls. I was the only one in the end who plucked up the courage to have a go. Although I lost [most of] the fear, I gained the knowledge that a lathe required a talent I just didn’t possess – that being able to turn out four legs all the same shape and size. LOL. FAILED BIG TIME! So decided at 15 years old that Lathe work was best left to someone who possessed the natural ability to work with a brilliant thing, and turn out wonderful works of heart brilliantly. I can fully understand you not being able to get to all of your crafty things yet. Moving house is a nightmare for a crafter. It took me just over a year before my Craft Room (or as my friend calls it – The Executive Art Annex – [lol], was set up well enough to actually begin crafting in it. And to be honest – it’s still not really right, even now. I continually move things around trying to find the place that they should be for the best. You’ll get there, my fabulous friend. Give yourself time to put your roots down. They don’t happen right away. Sending you vibes, through the ether, and whispering a wish to the universe asking for help to make you feel ‘at home’ enough to get into the groove again. Also sending much love and plenty of squidges. What a lovely post! This made my heart sing. Funnily enough, I was just saying to Sarah in the car yesterday, that I’ve never seen an acorn in real life. How I marvelled at your description of creature capers in your garden! I agree with you that these things are not insignificant, but their own little miracles. Whenever I see an email informing me that you’ve written a new post, I always get excited because I know it will be jaw-droppingly fantastic. Thank you Cobs for making my blogging experience so worthwhile. Aww, I’m just tickled from my head to my toes that you liked this post. But … you’ve never seen an Acorn in real life? Well that’s just a huge ‘miss out’ on one of natures gifts. You have to take yourself on a little car journey either to the local (biggish) park to find an Oak Tree … or a short ride out to the edge of town where town meets country, and find an oak tree. The acorns are falling like rain in February. You’ll find tons. You can make some brilliant crafty projects with Sarah, with them! And … if you dry them out somewhere dry and slightly warmish, and wait until they’re well and truly brown, you could then gently poke holes through them (or drill if they’re tough) and using a big needle (like a darning needle), you could string them together and make a Christmas Garland for the tree with them! (You can paint them too!). If the caps fall off, then just glue them back on again using a good craft glue. The ‘creature capers’ and Acorns, Sunsets/Sunrise, Conkers, Birds nesting in our nesting boxes … oh, and all the other wonders that are given to us freely …. I truthfully look upon them as Postcards … from Heaven. We all get them, every day. But we don’t always see them. Our minds get too busy with other stuff which bogs us down and can make us eventually feel dreary and miserable and it’s at that point that we stop noticing the Postcards altogether. Thank you so much for coming Sharon. It’s so lovely to see you here. Thank you for sharing a coffee moment with me. Have a truly blessed rest of your day. I hope you manage to look out of the window and see a few Postcards from Heaven yourself today. those are wonderful! Did you make the actual wooden part, too? You are so clever! The last time I used a lathe was when I was 15 and having lessons in woodwork. I knew within a few short weeks that the Lathe and I weren’t to be friends. A Lathe takes more talent than I have …. so no, I didn’t cut and / or turn those Acorns myself. So happy that you like them. Thank you so much for coming Salpal, it’s great to see you. Lol I understand! You “just” made them beautiful! Aww, Beverly, thank you, my fabulous blogging friend. Glad you like them. Your little squirrel tale reminded me of a time, many years ago, when I was out walking, and in the trees (well, on the ground) was a baby grey squirrel with the largest and palest blue eyes just looking at me. I was eating a salad barm at the time, so I crouched down, and broke off a small piece of bread and held it out toward the squirrel, not expecting it to really do anything. The next thing, the brave little creature ran over to me, held out both of its cute little hands, and gently took the piece of bread from me, and then ran back to where it had originally stood. I can still see those baby blue eyes to this day. They were GORGEOUS! I love interactions with nature such as this… shows that we still have a connection. I love magpies too… each has its own personality when you stop to look at them – and, if you make friends with a magpie, they are friends for life. And very protective. I’ve made a little gift for you, Cobs. Well, a little ‘thing’, if not a gift. A little something. On my blog, however, it doesn’t look that little, and that is something I will need to look at once I manage to gain control of time (I thought I had it, but the bloomin’ thing realised what I was doing and took back control itself!). I digress about technicalities. Remember when you made a button for my blog? Well, I’ve done one for yours now, based on your ‘C’ emblem. I must go now as this box seems to be starting to bevel with the amount of text I’ve added into it, and the bottom line is positively refusing to move further down. But once again, I love your post and your positivity is shining through. Have a great Thursday evening, Cobs. I ~ L.O.V.E. ~ the Halloween ‘C’ for Cobs widget button on your blog (and showing up here). It looks so perfect for the theme and feel of your blog, and, of course, so right for the time of year. LOVE it. Thank you Tom, for such a lovely gift and for honour of you putting the button on your blog. I’m totally tickled pink and madly happy. Bless your incredibly talented, beautiful heart. Love you oodles for it. I’m thrilled to pieces you like the Acorns. Thank you. They actually feel ‘positive’ when you hold them in the palm of your hand. I love them and know I’m going to struggle parting company with these because they’ve almost become like old friends. They give off such a fabulous feeling. Your squirrel which took the bread out of your hand. [nodding excitedly] … Some will come close to you. But be careful not to try and stroke, for they can bite if they feel uncomfortable. My mum had a squirrel who she befriended, and it used to come to her patio door and tap on the door with it’s little hands if the door was shut. (She would leave the door open a lot of the time as she loved the fresh air. She could feed that squirrel by hand too. It would come into the living room, and wait for my mom to give it a nut or some such delicacy, which it would take in it’s hand then transfer to it’s mouth and pop off, out of the door again. (She’s going to pull that face that only Mothers can pull when a child does something they’re not happy about, but in for a penny . . . ) . . . My mom lived in a bungalow, so all on one level. One day she’d left the living room to go to the loo, and while she was there, the squirrel came a-looking for it’s treat. Couldn’t see my mom, so decided it would go looking for her. Mom had left the bathroom door open just a tiny bit (she was expecting a parcel, so wanted to hear the door if someone knocked) …. that little squirrel obviously saw my mom through the slightly open door and did no more than joined her in the bathroom to ask for it’s nut. My mom said it both surprised her and made her laugh. She had to get off the loo (without flushing as she was scared that the noise would frighten the little creature) and go and find a nut for him. All the time, the squirrel stayed with her and waited for his nut. Once it had it’s treat, off it popped quite happily. What a brave little chap he was! Magpies … I love them! I know they can be a bit territorial, and they can scare the regular visitors to the bird tables and hangers and dishes etc etc in the garden here, I find them such fascinating birds. Did you know that they can be trained to talk? They can! Some years ago a friend had an aunt who rescued poorly or injured birds and animals, and got them to a vet, nursed them and got them well again. Those that could be released, were. But sometimes there were birds who were no longer able to live in the wild, so she would care for them for the rest of their lives. However … some children on their way home from school found an injured baby Magpie and went and knocked on the door. She took the bird to the vet. It had an injured wing and foot. It was treated and she bought it up, being a replacement mummy, until it was old enough to have the big run in the garden where it was living, opened and it was allowed to leave. It did. It flew around and came back. Each day the door was opened and each day the bird came out and went off on a jaunt – each day the jaunt became longer and longer. But when it was time for bed, the Magpie always came ‘home’. Aunt would just close the run door so that no fox could get in over-night, and then open it again the next morning. However …. because it spent SO long in her company, it learnt to talk! Seriously. Cross my heart and pinky promise that I’m telling the truth. I only ‘met’ him once but he was an absolute joy to be around. Such fun and so sweet. He would follow you around like a puppy. The most incredible animal. (Blackbirds can learn to mimic too). Aw Tom, it’s been fabulous chatting with you. Thank you so much for coming and for staying to leave a wonderful footprint. Thank you again for the blog button. It’s made my day. Bless your heart. Sending love and buckets of squidges, and wishing you a truly blessed weekend. Thanks, Cobs. Treating creatures with love and respect has rewards in more ways than one, as you’ve mentioned. I love it when I feel those connections. Thrilled to pieces that you like the Acorns, and thank you so much for your lovely words. They are such an encouragement to me Heather. Thank you, my lovely blogging friend. Cobs, your acorns and the messages are fabulous! Oh, how I wish I lived in shipping distance of you. They will make fabulous Christmas gifts, or a gift of encouragement to someone who needs it most. The Magpie cracks me up. Definitely a fun-loving, curious bird. In answer to your questions: Life is good (I am upright and breathing), no one is bugging me (as long as you don’t count Gibbs the cat at 4 a.m.) and I’ll have a biscuit as long as it’s gluten free. Hope you’re having a wonderful day. Hugzzzzz! Thrilled from my head to my toes that you like the Acorns. Yes, great for gifts, and the perfect size (in their boxes) for a gift on the table on Christmas Day, and you’re right – perfect for a friend who needs something to give them positivity or up-lift. The Magpie … he’s an absolute poppet. He dropped one in such a way last week that it almost hit the cat, who was sat on the decking. The bird didn’t do it to hit the cat, it just happened that the cat was there. Oh I know I won’t be loved all round for this, but I laughed like a drain when it happened. So funny to see the cat’s reaction. lol. GREAT to hear life is good, and no one is bugging you. As for Gibbs … being a pain in the rear end …. well that’s his job. At least, that’s what he thinks is his job. [snigger]. Gluten free biscuits coming up! Thanks for coming Mary, and for the great chat and coffee moment. It’s been brilliant. Aww, thanks Hannah! Bless your heart. Thank you for coming and for the lovely comment. Have a great rest of your day, and a fabulous weekend too. this may be my favorite so far- and like you, I too see miracles-they are everywhere!! and yes . . .I am buying a dear little cottage on a tree lined street, about a ten minute walk to Jennys’!!! Dear God, it is a complicated process . .and it will be a miracle, for sure!! Those acorns re adorable and very artistic. I love you like rain – and always will! love your rabbit!! I’m absolutely thrilled to bits and pieces to hear that you’re buying a cottage – and for it to be a short, ten minute walk to Jenny’s house is totally magical! I agree about buying and selling being a complicated process. I’m not sure if the increase in age makes it more complicated, or if that was just me. Buying our little cottage which we lived in for well over 30 years was worrying, exciting, fearsome at times, but joyous all the same…. was a walk in the park compared to selling our cottage and finding a new place to live hundreds of miles away. Then … add to that are the changes you want to make to your new residence. We lived in one room while the builders seemed to be in every other room. I actually had to send them out into the garden for a cup of tea (bribery) so that I felt comfortable going to the loo when there was a hole in the wall and they were on the other side of the hole!. I am praying that your sale and purchase goes smoothly and that everything works like clockwork. I also hope that you get packed and ready to go before the big day, and not suddenly find yourself at the biggest, nearest place which sold any sort of box, at 5.30am on the day of moving, when you discovered a whole kitchen cupboard that you’d forgotten to pack. (red face here. Yep… I did it!) lol. Thank you so much for coming Rabbit, and for the lovely message. I’m thrilled you like the acorns. Dear Cobs, thank you-I am packing and have got a lot done-I will write about all of it, when it happens, The cottage is adorable and just around the corner from Jennys! (on a beautiful tree lined street). Nice fenced in yard for my dog too. I have horrors of an expensive moving truck blowing the horn, while I am still packing-hah! please pray!! love your rabbit forever and always! The only worry I have is that your new cottage is big enough. Not so big that it’s waaaay too big. But not so small that you don’t have enough bedrooms, to have the boys sleeping there and Grand Babies (now you have 2! ), and enough rooms for you to put your favourite pieces of furniture, and display your much loved things. AND … just enough outdoors for you to roam a little and enjoy your garden. Basically … I want you to be beautifully contented and very, very happy. Praying for a safe packing and move. Well blow me down … you and I are obviously sitting on the same fairy wave length, for I tumbled some thoughts around my one brain cell about some metallic acorns too! Great minds think alike Gilly. 🙂 I’m still thinking on it though, because I also have another idea which is drawing me close to it too. So …. hmmmm …. what is it that they say? Watch this Space. lol. So happy that you like the Acorns. I had this little tickly feeling that you might, so I’m really happy that you do. Thank you for coming my lovely blogging friend. Hi Cobwebs, as always your ingenuity astounds me. Natures bounty is wonderful indeed and I simply love the dear little acorns with their beautiful thoughts. By the way I spied an old broom pole in the garage the other day, (made my little heart flutter). I’m still not doing any blogging at the moment, but sometimes I feel the pull and perhaps I will get back to it one of these fine days. The spied broom pole …. so … are you going to make anything with it? If so… what? I hope you get your blogging Mojo back again soon. You have too much to share with the world, and the world is waiting to hear from you! Thank you so much for coming, and for the lovely comment. Aw that must have been a true wonderment to experience Nancee! How fabulous that you were in the right place, at the right time, and received such an incredible blessing. Amazing. You’re spot on … nature really does have a way of making you relax. It’s quite magical. Thrilled you like the acorns. They’re so much lovelier in real life – sadly my photographic skills are on the lower end of useless. lol. Tickled pink that you like the Acorns. What a lovely thing to do with your found and collected things from your walks, holidays and visits out – collected in a vase, and it being sat on the hearth is fabulous,because it’s *there* all the time and so the memories are easy to bring back to mind. Brilliant idea! Thank you so much for coming. Love seeing you, my fabulous blogging friend.